Notes: This is modelled on the cost of a single daily charge of Invisibility, the idea being he is often unseen/unexpected until he suddenly appears to get the drop on the hero. As a child, Buddy idolized Mr. Incredible and even tried to become his sidekick, but was rejected as Mr. Incredilbe "works alone." Embittered but brilliant, Buddy built weapons, building a fortune, and saving the best for himself. He ended up building an amazing scheme to rid the world of its supers and become its foremost super himself, defeating a threat of his own devising. His plans were foiled by the Incredibles and he appeared to lose his life in a final confrontation with them. 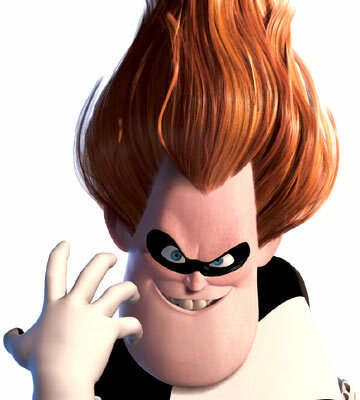 Syndrome is cold-hearted and entirely self-centered, having apparently lost touch with his humanity. His sole goal is the accumulation of power and ultimately glory as a perceived hero. "I'm still geekin' out about it!" "Too late - 15 years too late." Syndrome is the classic mastermind, and relies entirely on his gadgets and weapons, believing that which he's built with his intellect is unqestionably in control and superior to any opponent.